Begin by lying on your back on the floor. Bend your knees and place your feet flat on mat. Skootch your heels as close to your tush as you can. On an inhale, press your arms and feet into the floor and lift your hips into the air. If you wish, you can grab the edges of your mat with your hands, or you can clasp your hands under your back, rolling your shoulders under to open the chest even more. You can also lift your hands to support your lower back, pressing your upper arms into the floor. Continue lifting and extending the hips as high as you can. Keep the legs and feet parallel. Don’t forget to breathe! Exhaling, unclasp your hands and gently lower down to the floor. Hug your knees into your chest. Bridge pose is a backbend, stretching back muscles and helping to relieve back pain, as well as a chest opener, stretching the muscles of the chest, which can improve and expand breathing. Bridge also works the muscles in the tush and abdomen. The pose stimulates abdominal organs and can improve digestion. Those with back injuries may want to avoid this pose. Those with neck injuries may want to place a folded blanket under the shoulders to protect the neck and should only practice the pose under an experienced teacher’s supervision. I’ve practiced bridge pose for many years now, and my practice has grown and changed with time. When I lived in Boston, my teacher there emphasized working with the pose dynamically, coming into and out of it repeatedly. We would often do 20-30 repetitions, as if we were doing situps or pushups. Since moving to Philly and taking up a classical hatha practice, I’ve now learned to hold Bridge pose for several breaths. The two practices lead to very different experiences of the pose! I enjoyed working with Bridge athletically, and at first I resisted staying in the pose for a longer time; now I can appreciate settling in to the pose and feeling the stretch through my chest and back. 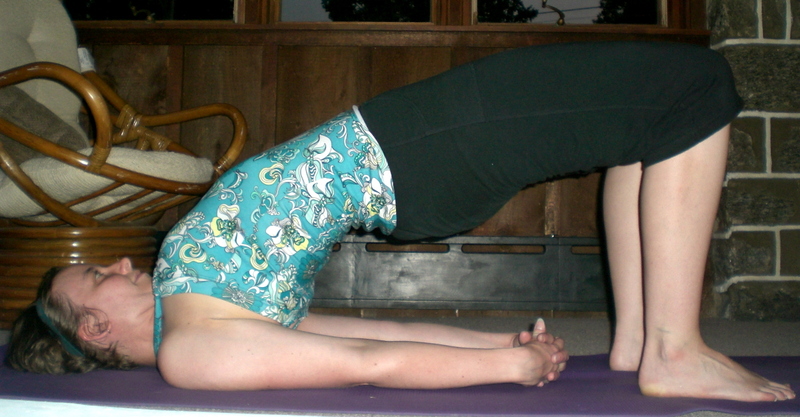 I enjoy the calm, pleasant feeling I get when I practice Bridge pose.